* Abraham Lincoln - Original Sculpture in Bust and Relief. 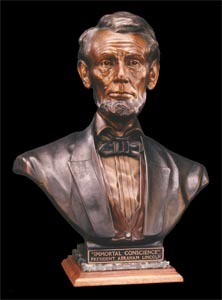 Abraham Lincoln: The Abraham Art Gallery offers original Lincoln limited edition sculpture by artist James J. Nance, essays by the artist on Lincoln and the bronze casting process, great Lincoln and art links, and free downloadable Lincoln photos from the Library of Congress. Be sure to visit our "Lincoln Store" to learn more about our Lincoln sculptures and gifts. Our museum quality art is affordable and available to the collector only through this site. Future Plans: In the future we plan to add more original sculpture for other well known U.S. presidents and notable Americans. Essays: Please check out our essay page where you will find interesting articles on art and Lincoln.